In this post, I want to expose and highlight some potential myths that may undermine effective training. But contribute significantly to the mass exodus that is kids soccer. Especially when parents decide to coach the team…or their lucky enough to get someone with a little experience but makes up the difference with the size of his EGO. A demonstration is the most common method used by coaches to convey information to the team. The assumption is that a demonstration is essential to show the players how to complete the drill or new skill. Demonstrations may be effective most of the time…but important questions must be answered first. Who should provide the demonstration? Will there be verbal instruction? Or will it be augmented feedback? The main reason for using a demonstration is to provide our children –team- a visual example of the drill. If the visual demonstration doesn’t move the players towards the intended goal, motor skills required for development will suffer. Motor skills like speed, accuracy and technique will become secondary when the child becomes hell bent on copying the coach. Lets not forget that certain goals will be prioritized at the expense of others depending on the drill to be learnt. When the goal of the demonstration is to help a child complete a particular outcome that is not directly dependent on the replication of a specific technique (eg. Passing the ball towards a target) a demonstration may be no more effective than verbal instruction. My argument is that demonstrations are overly constraining…forcing the child to adopt a movement pattern that may not be effective for him. Instead of a demonstration, tell the kids the desired outcome of the drill and let them problem solve and encourage them to discover how their actions and effects are related. This process engages the child in the problem solving process…encouraging them to take greater responsibility for their learning and find solutions to the problem at hand. I believe every child should be guided almost exclusively by the goal of the drill, not the actual technique. What are the goals of the drill? Are the kids achieving them? There are many ways to achieve the same end result and the child should be encouraged to explore these opportunities to develop flexible and adaptable movement patterns. Depressing and disheartening …than observing a coach over analyse a drill to the point where the child can no longer complete an easy drill. The child is worried about following coaching instructions as opposed to completing the drill. Can the child complete the drill? Can the child achieve the goal/s set out for the drill? Concentrate on the intended outcome of the drill instead of being hell bent on how the outcome must be achieved. Is there really only one solution? The kids will start to hide and no longer freely participate in drills because all of a sudden…completing a drill with the intended outcome is no longer enough because the coach wants me to put my leg here, my arms there whilst not looking at the ground. It may also be helpful to allow children to observe demonstrations from a variety of people (even parents) so they can appreciate subtle variations in technique and how these still get the job done. Can you pass the ball in between the 2 witches hats? The coach asks the player without a demonstration. Wait for the outcome- yes or no- rather than concentrating on how the outcome should be achieved. Once the child has worked on the drill and made his own adjustments – only then- demonstrations should be selectively introduced into the learning process, not vice versa. The difficult tasks for the coach is determining how and when to demonstrate so that children are not overly constrained and are able to develop a movement pattern to suit their individual needs. Specific Practice of a Single Skill is Essential for Learning. Practice should be structured around learning. Skills can be practiced in a blocked manner under constant or variable conditions. I see it all the time and was subjected to it as a junior. Coaches begin training with blocked, constant practice of a single skill before moving on to grid work and drill practices. This progression is highlighted by the shaded zone and directional arrow presented in the graph below. A criticism of this approach is that coaches move too slowly along the continuum, preferring the security of grid and drill type practice to the instability presented by match play or trying to replicate match conditions. When teaching children the instep pass…they should ensure that they vary the practice conditions by manipulating factors such as distance, speed, height or direction of the pass…and that the training session mimics the range of variations experienced during a match. Another important aspect to look out for is whether the coach organizes training in a blocked or random manner. Although random practice is difficult and has detrimental effects on performance during training, it facilitates greater learning. 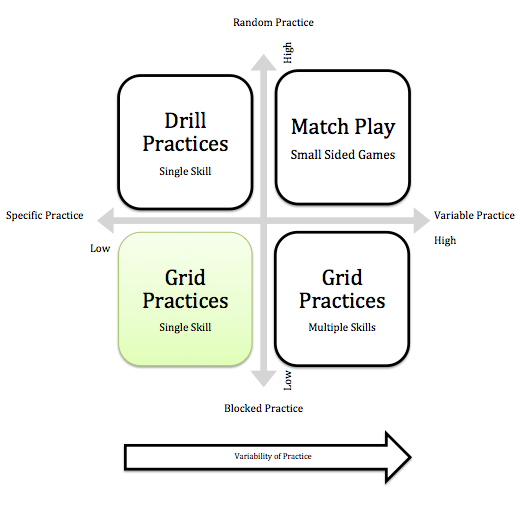 The important message is… while specific, blocked practice is better for performance; variable random practice is more effective for skill learning. Is the coach worried about performance at training to boost his own EGO or is he providing an environment for learning and development? Coaches’ feedback should be frequent, detailed and provided as soon as possible after the skill has been performed. Feedback is required in attempt to improve performance of a particular drill. The provision of feedback helps to promote efficient learning, correct development of a skill and influences the child’s motivation to persist with practice. What most coaches tend to forget is that feedback can be acquired through many different routes and methods. Feedback is always available as a natural consequence of performing an action. Scientist call this intrinsic feedback. For example…a child will be able to see, feel and sometimes hear the consequence of a pass in soccer without receiving any feedback from the coach…its basic trial and error. Information provided about the outcome of an action- such as the exact distance the ball travelled or the degree of error from the target- is referred to as “knowledge of results”. Information about how the movement was executed is referred to as “knowledge of performance”. This knowledge is essential so that coaches can determine when and how information/feedback should be provided to best encourage learning. 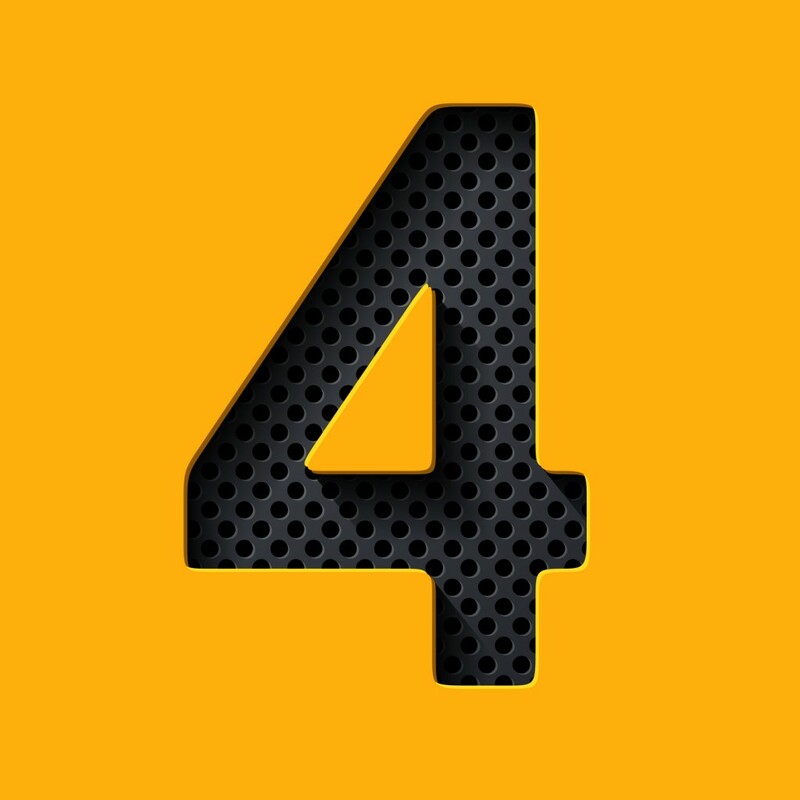 How often should feedback be provided? How precise should it be and when it should be provided? Providing augmented (external- coach, parent, friend) feedback on every trial has a beneficial effect on performance but a detrimental effect on skill learning. Providing feedback on every drill attempt can lead to an “overload” of information, result in over-reliance on augmented feedback and prevent the child from becoming adequately involved in the problem-solving process. The key issue with this myth or mentality is that children should be encouraged to rely on their own intrinsic feedback mechanisms rather than on information provided by the coach. Children must eventually perform without augmented feedback and unless they’re encouraged to become active problem solvers during practice, what chance have they got during match day? What chance have they got when the augmented feedback dries up? The optimal frequency of augmented feedback appears to be dependent on the player’s stage of development as well as the complexity or difficulty of the task. As skills develop, the frequency of feedback provision may be reduced or faded out to encourage learners to detect and correct their own errors. Children should be viewed as active problem-solvers rather than empty vessels or passive recipients of information. Prescriptive coaching is always better for skill acquisition than guided discovery. The approach favoured around kids soccer today is essentially prescriptive or hands on… the belief being that the coach possesses all the necessary knowledge and that this information must be passed on to the child. This authoritarian approach is personified by the frequent use of demonstrations and verbal instruction when conveying information to the child…and the overabundance of augmented feedback and guidance as to how behaviour should be modified on subsequent attempts. The coach has a strict criteria and the child must mimic his movement patterns accordingly. A common theme throughout this section is that overly prescriptive coaching is detrimental to skill acquisition. Recent evidence suggests that skills taught using such approaches are less resistant to the effects of psychological stress and more prone to quitting the game. Put the emphasis on guided discovery. When learning by guided discovery, the children need to take responsibility for their own development…finding unique solutions to movement problems through exploration & discovery. These “hand off” approaches are more effective in developing children who are able to complete a drill outcome. This does not imply that the importance of coaching is diminished, merely that the role has to evolve and be re-defined…so that the coach can shape and guide rather than dictate the learning process. Some coaches feel the need to justify their existence and consider that this is best achieved through a disciplined, authoritarian style…irrespective of the cost.